As a sales growth specialist, OMG’s world-class sales assessments are an integral part of my strategy to help my clients improve their sales results. guide you to discover what you need to do in order to coach and mentor your salespeople to achieve their full potential. 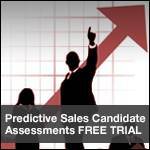 Take a look at the Sales Candidate Assessment by taking a free trial. To calculate the cost of your hiring mistakes, visit my Sales Talent Aquisition page. I’m a firm believer of the don’t –fix-what-aint-broke school of thought. Why waste time and money on what’s already working? You want to know what you need to do to fix the hidden weaknesses that are stalling your sales growth and keeping you from going from good to great. If you haven’t done so already, I firmly recommend using OMG’s assessments to improve your sales results. How effective is your current sales effort? Answer just 22 questions (it’ll take less than 5 minutes) and this Objective Management Group tool will provide you with an instant score on the relative effectiveness of your sales force. Leadership Lesson: Effective assessments provide accurate insights to grow your sales, profit, and market share. Leadership Question: How might an assessment of your sales force help you improve your sales results?